Merry Christmas 2017! Vic Sadot @Rocktopus Open Mic! (5:08) Vic Sadot YouTube Channel. “Please Come Home For Christmas” (Charles Brown and Gene Redd, 1960). And if you are looking for Unique 2017-2018 Seasonal Gifts! 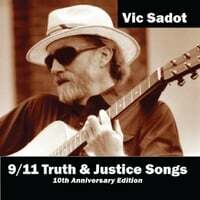 VIC SADOT 4 CD’S AVAILABLE AT CD BABY! Vic Sadot and the Crazy Planet and Planete Folle bands have been releasing original songs and a fine mix of covers since 1985 at CD Baby! VIC SADOT CRAZY PLANET BAND T-SHIRT SHOP at Café Press – All Vic Sadot album covers ever released are now available on T-shirts and mugs at Vic Sadot Crazy Planet T-Shirt Shop at Café Press: “Good Time Delaware” 1985 45 rpm single; “Ride the Wind” 1988 LP; “Comin’ Home” Planete Folle 1997 CD; “Broadsides & Retrospectives” 2005 LP; “9/11 Truth & Justice Songs” 9-11-2011 10th Anniversary CD released on 9/11/11 with 16 songs; and “Truth Troubadour” 12-19-16 with 18 songs. Previous Post Unique Seasonal Gifts! VIC SADOT CRAZY PLANET BAND T-SHIRT SHOP at Café Press! Vic Sadot CD’s at CD Baby! Next Post Merry Christmas 2017! New Year 2018 Salutations! Vic Sadot at Octopus Literary Salon “Rocktopus Open Mic!